The knuckle joints in the fingers act as hinges between the long bones in the hand and the smaller bones in the fingers. These joints are called metacarpophalangeal joints or MP joints of the hand. The MP joints are important to the hand for gripping and holding things. Pain and deformity in the knuckle joints of the fingers are common in rheumatoid arthritis. This pain and deformity may be caused by trauma, gout, psoriasis, or other diseases. Diseases such as those mentioned can injure the MP joints by ruining the structures and muscles that move the joint, or by destroying the surface of the joint causing pain and deformity in the knuckle. Difficulty in using the hand for daily activities (holding or gripping a cup, tool, or eating utensils for example) is the most common complaint of patients with MP joint disease. These problems in using the hand may be due to deformity, pain, or both. Many patients notice their fingers slowly drifting (leaning) to the little finger side of their hand. Daily activities may become more difficult with time. What causes it? There can be many reasons for these symptoms to occur. The ligaments that hold the joint in place can be loosened by the disease, causing the joint to slip out of place and eventually dislocate. The tendons at the top of the joint may slip out of place and lose their ability to straighten the fingers. Treating the symptoms can sometimes be done without surgery. Medication, splinting, change in daily activity, and injections of anti-inflammatory medicine may be recommended by your hand surgeon in the early stages of MP joint disease. If these forms of non-surgical treatment do not work, surgery may be needed. Some advanced cases of MP joint disease may need surgery. Two types of surgery are commonly preformed. The first is generally done in less severe cases and is called synovectomy or soft-tissue removal. 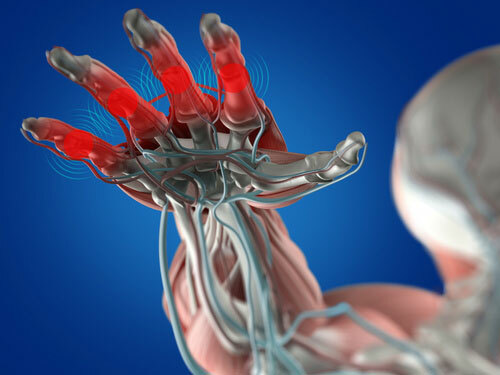 If the tendons have slipped out of place, they are put back into place over the knuckle joint. If the small muscles of the fingers are causing the fingers to lean toward the small fingers, the muscles are operated on to stop the fingers from being pulled toward the little finger. The second type of surgery is joint replacement and is generally used on more severe cases of MP joint disease. The diseased metacarpophalangeal joint is replaced with an artificial joint. Complications with this type of surgery may happen. Infection is possible or the artificial joint may eventually break or wear down. There is a possibility that a second replacement of the joint or fusion of the joint may be recommended in later years. The goals of treatment are pain relief and restored motion of the fingers. Your hand surgeon can advise you on the best treatment for your situation.